This is a nice, ditty of a western. The characters were interesting and it had a lot of history, which created a solid world. The strife, remorse and desire for revenge (on both the goodie and baddie side) were grounded in the character’s very beings. Great job! There wasn’t a ton of action, but what was there was done well. It’s refreshing to watch a movie that isn’t so heavy on the special effects that it takes away from the storyline. The main reason this didn’t get 5 bats is the flashbacks * sigh * – there were way too many and the ‘ghost’ shots would have been more effective if there were fewer. They also killed my favorite character in this entire film at the end, so that kinda irked me. 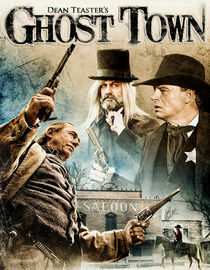 Those aside, this is a fun western to watch. Fairly clean, lots of tension and lawlessness!